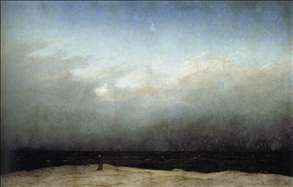 The greatest German Romantic painter and one of the most original geniuses in the history of landscape painting. 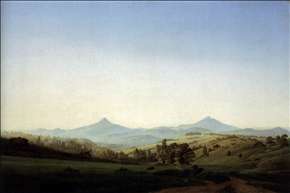 He was born at Greifswald on the Baltic coast, and after studying at the Copenhagen Academy with Juel and Abildgaard from 1794 to 1798, he settled permanently in Dresden. 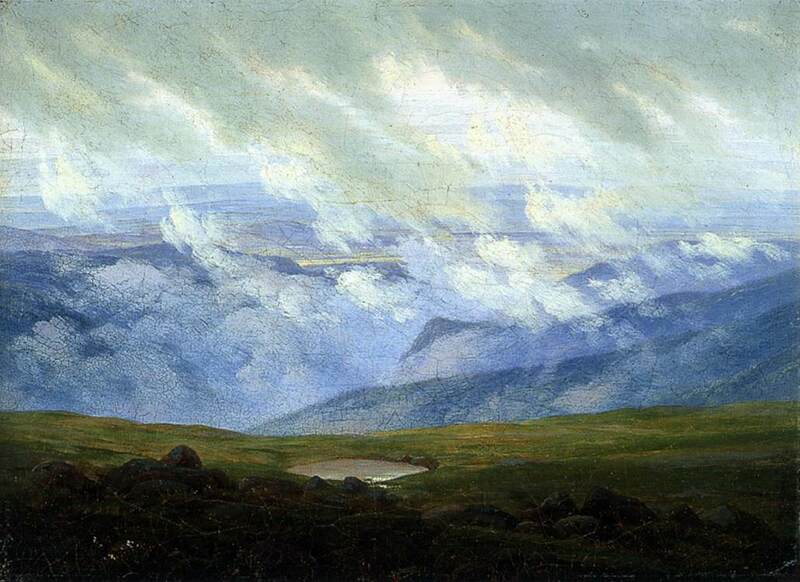 There he led a quiet life, interrupted only by occasional excursions to the mountains or the coast of Pomerania, pursuing with a rare and instinctive single-mindedness his personal insight into the spiritual significance of landscape. 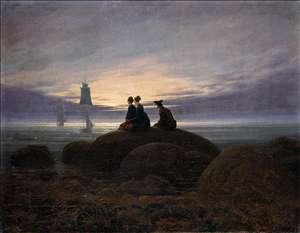 He was intensely introspective and often melancholic (although his marriage at the age of 44 brought him much happiness), and he relied on deep contemplation to summon up mentally the images he was to put on canvas. Close your bodily eye, so that you may see your picture first with your spiritual eye , he wrote, then bring to the light of day that which you have seen in the darkness so that it may react on others from the outside inwards. 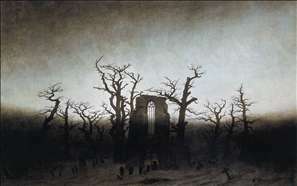 Friedrich began with topographical drawings in pencil and sepia wash and did not take up oil painting until 1807. 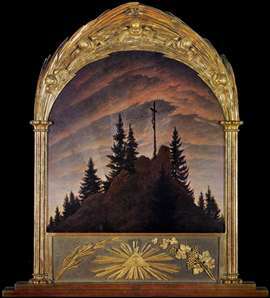 One of his first works in the new medium, The Cross in the Mountains (Staatliche Kunstsammlungen, Dresden, 1808), caused great controversy because it was painted as an altarpiece, and to use a landscape in this unprecedented way was considered sacrilege by some critics. His choice of subjects often broke new ground and he discovered aspects of nature so far unseen: an infinite stretch of sea or mountains, snow-covered or fog-bound plains seen in the strange light of sunrise, dusk, or moonlight. 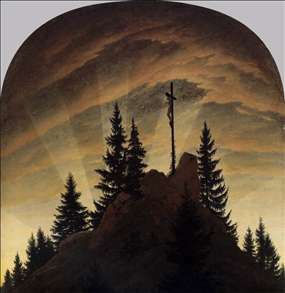 He seldom uses obvious religious imagery, but his landscapes convey a sense of haunting spirituality. 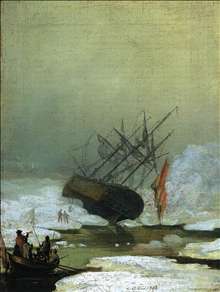 Friedrich had a severe stroke in 1835 and returned to his small sepias. 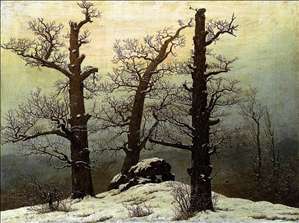 He was virtually forgotten at the time of his death and his immediate influence was confined to members of his circle in Dresden, notably Georg Friedrich Kersting, who sometimes painted the figures in Friedrich s work. 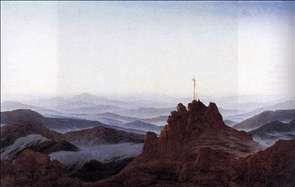 It was only at the end of the 19th century, with the rise of Symbolism, that his greatness began to be recognized. Most of his work is still in Germany. See more details about "Wreck in the Sea of Ice"
See more details about "Dolmen in the Snow"
See more details about "Cross in the Mountains (Tetschen Altar)"
See more details about "Monk by the Sea"
See more details about "Drifting Clouds"
See more details about "Moonrise by the Sea"
See more details about "The Abbey in the Oakwood"
See more details about "Bohemian Landscape with Mount Milleschauer"
See more details about "Morning in the Riesengebirge"